This advertising inflatable can display a banner 20′ x 10′ which is a full size industry standard Billboard. We can produce in house full colour photo quality advertising banners to suit any customer application. 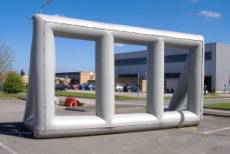 Vistabanners.co.uk manufacture a wide range of inflatable billboards, Our billboards have the strength, power and ability to attract attention. 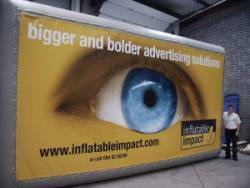 Inflatable Billboards are a fantastic way to advertise a company, product, or event. An extremely versatile product due to the fact that it’s mobile. i.e.not permanent and that the banners can be changed in minutes. For more information call us now on 01942 396091 or Contact Us using contact form.